Cam's Cinematic Episodes: Jump-starting Geriatrics! ...And Other ROCKY Developments! Jump-starting Geriatrics! ...And Other ROCKY Developments! tomatoes.com today regarding Indiana Jones IV and Harrison Ford's eagerness to reprise the role. It's basically a fluff-piece of nothing concrete (Hence the lack of a link), but it got me thinking. What is it of late that has inspired this trend of dusting off long-dead franchises? Now, to be fair, Indiana Jones IV has been "in development" since 1994 or so. It ain't a recent development. I have my doubts, however, about it coming together in the next little while, judging from George Lucas's non-committal attitude. I think the time has come to either make the damn thing or shut up already! Is there really a high demand for another film in this series? The last chapter, Indiana Jones & The Last Crusade ended on such a poetic note, with the characters riding off into the sunset. Also, it was called THE LAST CRUSADE! On top of all that, those films were released over a relatively short period of time ranging from 1981-1989, a perfect period of time to keep the tone of the films consistent. To me, it's time to call it a day. The book has been closed for 17+ years, for the love of Mola Ram! The Indiana Jones films, for me, are very much films of their time. They embraced a more old-fashioned attitude towards action and adventure, an attitude long annihilated by filmmakers like Michael Bay. There was a sort of playfulness and panache to the violence, that may seem sort of odd to today's audiences. It's not easy to go back to that style either: Look at the Star Wars prequels and compare them to the original films. There is a definite modern sensibility of upping-the-ante of the violence in the newer films; more decapitations, impalings, etc. I find it unlikely they wouldn't try something similar with the Jones series (Heck, George Lucas is producing!). Most importantly, I have a certain image of the character of Indiana Jones. Seeing 64-year old Harrison Ford cracking the whip wouldn't quite fit that. Yeah, I have faith that Spielberg can deliver a good movie, but is this film really necessary? Why not create something new that could feature Ford as a new character, more fitting of his current place in life. 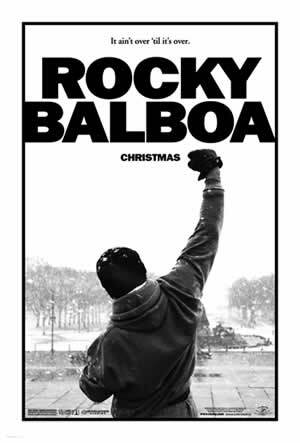 Speaking of 60+ year old actors returning to classic roles, this Christmas will mark the return of Rocky Balboa in the film of the same name (I guess they figured Rocky VI sounded too redundant...). Now, this one makes a little more sense to me. Anyone who saw Rocky V felt a bit of a sense of disappointment of how the series supposedly ended. Watching Rocky beat up Tommy Gunn on a dirty Philadelphia street was kind of pathetic. After the glitz and decadence of Rocky IV, it didn't quite fit. It was an odd, sad little film that didn't do the character justice. I'm hoping that Rocky Balboa can correct this, it's just unfortunate they couldn't have wrapped it up sooner, preferably with a better fifth instalment. Seeing 60 year old Sylvester Stallone bobbing and weaving around the ring is stretching it a tad (Despite the fact the man doesn't appear to have aged past 40.). While I'm casually optimistic and accepting towards the return of Rocky Balboa, I'm less excited about seeing the return of John Rambo in Rambo IV: In The Serpent's Eye. First off, who thought of that title? It sounds like a bad direct-to-video cheese-fest starring Jan Michael Vincent or Michael Dudikoff! Bah! Yes, folks, the 80's is coming back in a big way. On top of the above, we have the often mentioned (By me!) Live Free Or Die Hard & Terminator 4 to look forward to in the near future. There's even been rumblings of a fifth(!) Lethal Weapon film. I'm just curious as to when RoboCop is going to get rebooted. God knows, they made him fly in RoboCop 3, and the mind marvels at where they can take him next! So, I'll see you at the theatres in 2009 when RoboCop 4: Mechanized Mars Attack Avenger hits theatres. ____________________________________________________________________ Okay, now to talk about something I know little about! ...And that would be the video-game based property Halo. Now, I'm not a video game enthusiast, or "gamer" as they prefer to be called (According to my friend Gabe), but I have a small morsel of interest in the upcoming Peter Jackson produced film adaptation. Seems, the mighty franchise has hit a snag over financing! (HERE: http://www.rottentomatoes.com/news/comments/?entryid=374299), it seems Universal and Fox have dropped out of the project, seeing the hugely expensive venture as being a little too risky. Can't say I blame them. The typical video-game movie doesn't make much, with the highest grosser, 1995's Mortal Kombat, doing 90 mill or so. Halo, from the looks of it is going to cost well into the 100 million bracket, more than double what recent video game films such as Silent Hill, Doom, and the Resident Evil franchise have pulled in. I have no doubt Halo will go into production in the near future (Peter Jackson being attached helps significantly), and I for one hope that it's good. Why? Well because I've had all I can take of awful video-game adaptations! Doom and Resident Evil: Apocalypse weren't simply bad, they were boring, embarrassing, pathetic efforts with not a single ounce of cleverness or originality. Because of them, I haven't been able to bring myself to rent Silent Hill. 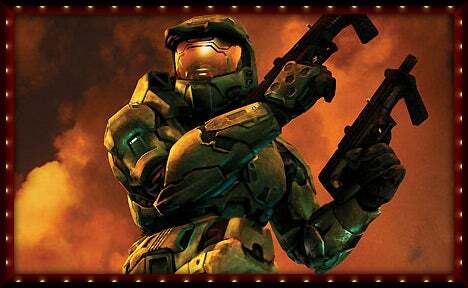 So, here's hoping Halo breaks the cycle, because I'd like to see the stigma of the "video-game based" film disappear. Well, that's all folks. I better get back to the script I'm writing. You want a picture that has it all? Drama? Suspense? Hilarity? Well this is it! It's a faithful adaptation of the classic NES game Duck Hunt, and it's gonna be BIG!!! Don't Worry, Chief, We Saved the House! Why you Cun-try loving little girl! Who am I going to get to climb up into that musty old clap-trap? The only question is, Do I tell Richard Lewis? Yes, that's me, masterbating in the shower. Without sunglasses, I'm just some old man.